Even people who love to travel know how hard it can be on the body after a certain amount of time. If you fly a great deal, chances are you have already experienced the aches and pains that go with the territory. There is a real and growing concern among frequent flyers and airline employees as study after study provide direct links between serious illness and flying. (Including cancer) The least of these is cognitive decline. The most bothersome, however, is a condition called decompression sickness. Aside from flying less, there are a few things that you can do to make the miles slip by a little more quickly so that you do not notice the discomfort quite as much. These tricks really help, especially on a flight such as New York to Sydney. Spending 18 hours in an airline seat is not the most comfortable experience you will ever have, that is for sure. Some of these may not seem like much, but each has its researched attributes and may surprise you. Take our first suggestion… a good book. Bring your Kindle, Ipad, or Nook with you and you have sure entertainment. It may not seem like bringing a book on an airplane is deeply thought out, meaningful advice, however, studies have shown that reading during a long flight may help reduce the effects of jet-lag. When you read, you are engaging the part of the brain that is susceptible to decompression sickness. Reading and structured thinking allows you to engage the part of the brain that experiences cognitive decline. 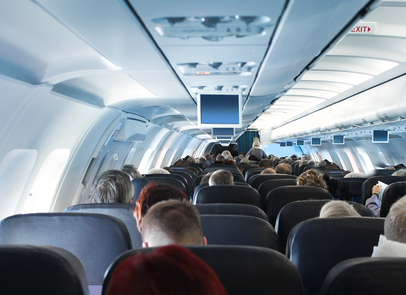 Flexing that part of your brain while in-flight allows you to counter the cognitive effects. A book is good. Work is better if it involves research and taking down notes, and puzzles… such as crosswords or cryptographs are best. That is also the part of the brain (The hypothalamus) that produces serotonin, (The happy hormone) which later becomes melatonin… the hormone the body lacks during jet lag. If you want to just get through your flight, you may want to experiment with which sleeping pill works best for you well before the flight. If you have a good relationship with your family physician, let him or her know about the trouble you are having while flying. They may be able to prescribe something a little stronger if you cannot find an over the counter solution. Sleeping through your flight does not help with any medical problems you may be experiencing. It may also make jetlag worse, but at least you get the flight over and done with quickly and spare yourself so many hours of pain. If you are taking nsaids for pain relief, you must be careful not to take too many as doctors have lowered the bar from 4,000 milligrams being the safety line, to 2,000. They say that anything over that will begin scarring the liver as it fights to filter the chemicals from your body safely. By not taking nsaids and occupying your mind to deal with joint pain, you save yourself some misery and get through the flight with your liver intact. People tend to feel better when they are clean. Traveling from one continent to the next always delivers an unexpected turn of events or two, even if in that turn nothing happened at all, which would be unexpected. For these reasons, It is a good idea to always pack a change of clothing and the basic toiletries you will need to spruce up in an airport bathroom in the middle of the night. Delays, cancellations, and layovers are part of the traveler’s world so it pays to be prepared. As your fellow passengers sit around, you are relaxed, clean shaven, the mild aroma of bay rum wafting in the air around you, a clean pair of socks making you feel like the king of the skies. Comfort goes a long way to pain alleviation and the ability to hold on to a good mental attitude. My smartphone is always ready to do a dummy-booking, ghost booking, or fake a flight booking just to get a look at the seating plan. What this does is show me where I can go on the plane to stretch out and get comfortable. Make sure your iPod/Smart Phone/iPad has a complete charge before you leave the deck. Avoid eating airline food; airline food is one of the worst food on the planet. In fact, it is not really food. Have you heard of a pie in a roadside café that had so many preservatives in it that it remains fresh to this very day? (They baked that thing in 1955) With airlines, they start with a big pile of preservatives and add just enough food to make it look like food. See this article about the healthiest and unhealthiest airline foods to see your options. Most airports offer good salads, sandwiches, and snacks after the security checkpoint. See what foods you are able to take with you and purchase them. Packing a light lunch may be a better option than eating airline food. Believe me, this is not people’s first choice, however, sometimes you meet some of the most interesting (and talkative) people. You never know, this may lead to friendships or connections. Most likely, they will not want to speak to others at first either, but eventually everyone reaches that point in travel where they are ready to have a conversation in the bathroom mirror if it would break the monotony. If you are on an over the ocean flight and are wearing a suit and tie… well, I feel for you. You must be new at this, so we will cut you a bit of slack. It breaks down to this. If you are not comfortable, you are not doing it right. Try following these guidelines. Anything less than five hours…, you decide. The point is that comfort is everything on a long flight. Speaking of comfort, stay sober, my friend. Drinking and flying do not mix and is the number one cause of depression after a long flight. It also prolongs the effects of severe jet lag. Fighting Desynchronosis can be tough. One out of every 200 fliers gets jet lag so severely that they are incapacitated for 24 hours or more after a long flight. Like the common cold, medical science has been baffled by jet lag and how to combat its annoying effects. Thank goodness for the 21st century! Someone finally figured out that the hormone called melatonin greatly decreases during a long flight and that greatly enhances the symptoms of jet lag. If you travel much, these ten tips can make your travel a bit easier and hopefully, you will be more comfortable. The one thing that we did not mention is that the better attitude you have going into a long trip, the faster it will go and the fewer problems you will have. In the meanwhile, we hope that some of these work for you and that all of your travels be north to south.